My name is Arianna Spero. I was an ordinary girl, living an ordinary life, until my mother lapsed into a coma. Now, I am her only hope. She made a deal with the devil, and on my 18th birthday he came to collect. But there's a way to save her. There's something the princes of hell want more than my mother. 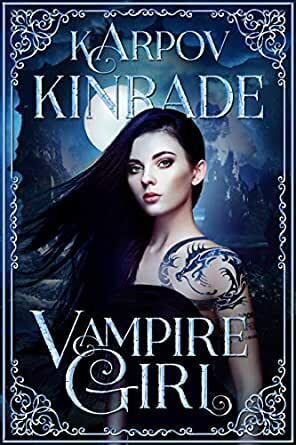 Karpov Kinrade is the pen name for the husband and wife writing duo of USA Today bestselling, award-winning authors Lux Kinrade and Dmytry Karpov. Together, they write novels that span a wide array of genres, from science fiction and fantasy to romance and mystery. 5.0 out of 5 starsPleasantly surprised. I wasn't sure what to expect from this book, but I was pleasantly surprised. I've read alot of books in this genre and after a while it all becomes predictable and boring, the same story lines, world's, creature's etc, but I continue to read them in the hope that I'll stumble upon a gem. This book was a gem for me, the worlds created by the authors were really creative and well thought out. Down to every realm, capturing the sevens sins, in ways that are different, but still representative of what each sin stands for. The characters are great and the story is captivating, reading each word you were able to get lost in your mind visualising the scene playing out in front of you. I would love to see these worlds come to life! I admit, from the cover & description I thought it was going to be a twilight-ish romance about a useless Mary-Sue. I am so happy to be totally wrong! Interesting and unique with funny, likeable and beautifully flawed characters. If you like romance, adventure, loyalty, princes or plots you'll find something to like in this book. 5.0 out of 5 stars7 Princes of Hell, 1 girl who has to make a choice. Who would you choose? I couldn't wait to read this book. I have been a fan of Karpov-Kinrade for a while now and have loved watching their writing develop. Vampire Girl introduces us to Arianna Spero on the morning of her 18th birthday, who, to save her mother, has the enviable/unenviable task of choosing one of the seven princes of hell to become his wife and princess then eventually, Queen. This is one strong girl, who is as vulnerable as we all are but will stand up for herself no matter what. As I began reading I was very quickly drawn into her world. Early on we meet Asher, one of the princes and then another, Fen. Her interactions with her friends were so 'normal' reading them was like listening to friends talking. I found myself laughing out loud on one particular page and ended up reading it to my partner who laughed as much as I did, and so outraged and angry on another. Feeling every bit of Arianna's journey with her. This book was one of few that I could actually see as a movie or TV series. The ending left me wanting more and I can't wait for the next book. Have read other books in this vane, but was surprised how interesting this one was. I listened as an audiobook so can’t make comment about the grammar as 1 reviewer did. I felt the descriptions were good and the main character had a backbone not a whimpering female. Definitely need the next book as the ending in this one went in a direction I was not expecting. I really enjoyed this book. I loved the idea of different realms and how the characters have been built. I also liked that anyone other RH books, they don't all instantly like her and you instantly don't like some of them. This book focuses on the prince of war and I think he won me over. I'm looking forward to the next book. An unimpressive and uninteresting book with a very simplistic plot and world build. Not of value for anyone who values character, story structure or even mindless romance.